Here is some more of the stuff I know, about what happened in Albuquerque and the surrounding atmosphere. Some of it I learned by asking folks, or by reading about events that occurred before I was born, things I heard about when I was a kid. My father was always a good source for that sort of information. So was Howard Bryan. But I gotta tell you that some of the vast reserves of memory locked in the fatty tissues filling my thick skull came from television transmissions. I grew up on the edge of the rez. Because of my old man’s relationship with Tio Sam, my family had access to cable and satellite programming that was practically unheard of in the late nineteen sixties. In particular, I liked to watch the programs emanating from the city of angels, from KTTV-TV; reruns of The Outer Limits and 77 Sunset Strip, Connie Chung's noontime newscasts, and so forth and so on. I also spent many a laconic afternoon tuning into Albuquerque stations. As an nine year old, I was hooked on Dialing for Dollars, a show that was broadcast live from the KOAT TV studios, five days a week. The aforementioned activity went something like this: the station screened cheesy movies (including the ouevre of Marjoe Gortner) and during commercial breaks cut to the studio. There, the host, standing in the middle of a folksy but brightly painted and cardboard set, drew a phone number (clipped out of the Burque White Pages) from a spinning drum. He dialed the number. If a human on the other side answered and knew what movie was currently emanating from said studio's technical broadcast facilities, then blam! The lucky viewer won at least seventy-seven dollars. That kinda exposition of the random nature of electronic existence, plus the seeming contradiction of this randomness (each time there was no winner, the prize was raised in value, with each iteration ending in seven: 77 dollars, 87 dollars, 97 dollars, and so on and so forth) drew me back for weeks. I also gained an appreciation for mediocre filmic productions, a proclivity that continues to influence my intellectual and literary output. Besides Dialing for Dollars I was also partial to the Val Del La O Show on KOB. Broadcast live on Saturday afternoons, the De La O Show was a Spanish language variety program. Val was urbane and hip, his sidekick clownish and messy. For years, as he highlighted the latest in homegrown performing arts, I watched and listened carefully, honing my Spanglish and allowing his broadcasts to symbolize my journey away from childhood; the show came on after the morning cartoons and seemed to be an prescient indicator of the culture I would inherit someday. 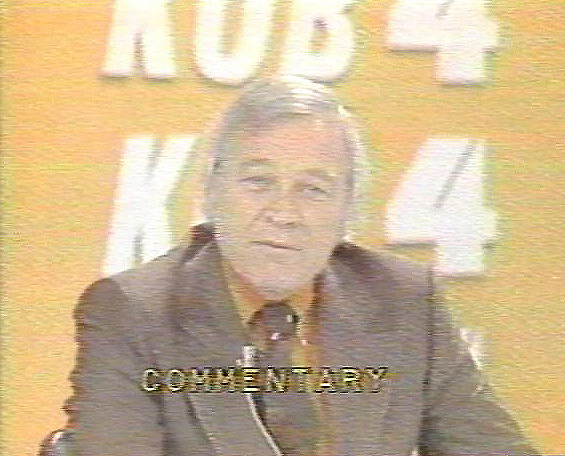 My favorite early electronic media experience though, was rooted in the kick I got out of watching and listening to the news shows on KGGM TV 13. It’s called KRQE now, but back in the sixties and seventies, it was locally owned and displayed a sort of hyperlocality in focus that was keenly evidenced in the on-air talent. The son and daughter of the owner, who served as anchors, presided over a circus that included the lovably shambling and disheveled weatherman, Hartsell Crib (whose toupee often awkwardly shifted position as he sweated and grunted through his rambling descriptions of this and that high pressure system, or of the interminable heat of the Albuquerque summer) and more influentially, the inimitable ravings of Gordon Sanders. Sanders was a local wag whose favorite targets were the city government and the mayor. A larger than life and often combative man, he was hypercritical of the powers that be, would get visibly upset during his on-air commentaries, allowing his passion for the working man and his distrust for the ruling class to become battle cries for justice and redemption. His peculiar brand of populism and angry activism has all but been lost to those who followed him, those of the shiny smiles and perfect hairdos who have ubiquitously infected American television journalism. At the height of his popularity, Sanders ran for mayor of Albuquerque twice, but lost. Sanders' bellicose tone eventually cost him his job at KGGM, so he moved on to the station that was home to the Val De La O show, where he served as news director. He continued to spin his tales of cyclical poverty and government greed until his retirement. In my research on Sanders, I came across only one video document of his informed, precious, and wholly unorthodox brand of broadcast journalism. While Sanders spoke about the high cost of meat and how citizens were being duped into buying unhealthy and unwholesome versions of the butcher's produce, an unknown citizen snuck into the studio and let Gordon have it in the face with a banana creme pie. I suppose there is some tragedy in that fact, in the path of reductionism that is symbolized and mythologized in a clownish act that rendered intelligence as comedy and rewarded shallowness as somehow newsworthy. So, tonight, if you get around to it, and the bright, one-eyed god is willing, take a close look at the humans who came after Gordon Sanders, noting if nothing else their intrinsic and cosmetically enhanced effervescence, even as the beautifully ugly ghost of Gordon Sanders lingers somewhere in the teevee studio, on the airwaves beaming their way toward other, grateful worlds. I won't be able to join you all though, my television hasn't worked properly for years and years; the screen is more often than not overcome with the static of history. But, hooked up to a DVD player, it's great for watching bad movies, yo. One of my favorite old tv memories is watching "The Andromeda Strain" on Dialing for Dollars.